According to a post on the White House blog, 17 million tax transcripts have been downloaded over the Internet since the feature launched in January 2014. The interesting outcome is that, according to the post, offline requests are down by 40%. There was no clear return on the investment provided on what providing this online service saved taxpayers, but if we assume there are processing costs involved with sending transcripts through the mail and that, once online, the Internet service scales, that’s a good result, as is enabling instant electronic access to something that used to take 5-10 business days to arrive in print form. Promising. I hope that the leadership of the IRS explores how the agency could act as a platform to enable more, much-needed innovation around personal data access and digital services in the years to come, enabling a modern ecosystem of tax software based on a standardized application programming interface. Improving online self-service could have an enormous impact upon every single American taxpayer, from saving tax dollars on the government side to saving time and gray hairs year round in offices and kitchen tables. Per Sinai and Mathur, the IRS currently receives over 80 million phone calls per year, sends out almost 200 million paper notices every year, receives over 50 million unique visitors to its website each month during filing season. 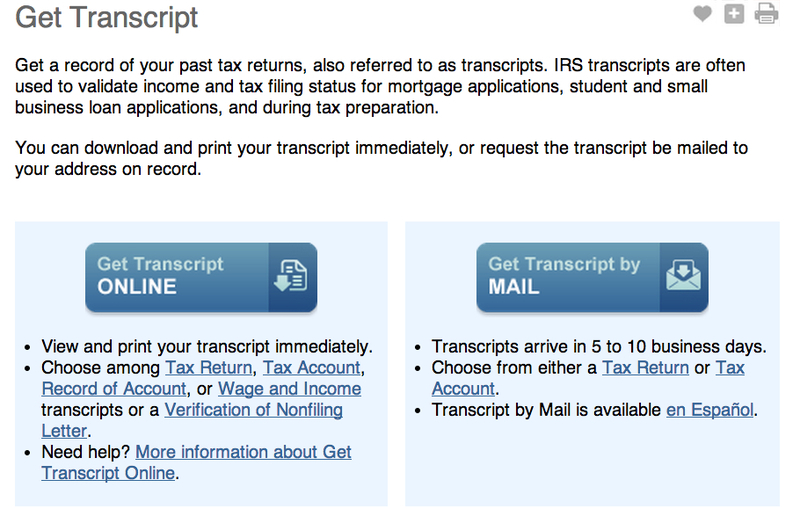 More context and FAQ on how to download your tax transcript here. UPDATE: This service was taken offline after IRS security was compromised. In January 2014, the IRS quietly introduced a new feature at IRS.gov that enabled Americans to download their tax transcript over the Internet. Previously, filers could request a copy of the transcript (not the full return) but had to wait 5-10 business days to receive it in the mail. For people who needed more rapid access for applications, the delay could be critical. It’s a list of the line items that you entered onto your federal tax return (Form 1040), as it was originally filed to the IRS. Wait, we couldn’t already download a transcript like this in 2014? Nope. Previously, filers could request a copy of the transcript (not the full return) but they would have to wait 5-10 business days to receive it in the mail. Why would someone want their tax transcript? As the IRS itself says, “IRS transcripts are often used to validate income and tax filing status for mortgage applications, student and small business loan applications, and during tax preparation.” It’s pretty useful. OK, so what do I do to download my transcript? Visit “get transcript” and register online. You’ll find that the process is very similar to setting up online access for a bank accounts. You’ll need to choose a pass phrase, pass image and security questions, and then answer a series of questions about your life, like where you’ve lived. If you write them down, store them somewhere safe and secure offline, perhaps with your birth certificate and other sensitive documents. Wait, what? That sounds like a lot of of private information. True, but remember: the IRS already has a lot of private data about you. These questions are designed to prevent someone else from setting up a fake account on your behalf and stealing it from them. If you’re uncomfortable with answering these questions, you can request a print version of your transcript. To do so, you’ll need to enter your Social Security number, data of birth and street address online. If you’re still uncomfortable doing so, you can visit or contact the IRS in person. “The IRS has made good progress on oversight and enhanced security controls in the area of information technology. With state-of-the-art technology as the foundation for our portal (e.g. irs.gov), we continue to focus on protecting the PII of all taxpayers when communicating with the IRS. However, security is a two-way street with both the IRS and users needing to take steps for a secure experience. On our end, our security is comparable to leaders in private industry. Our IRS2GO app has successfully completed a security assessment and received approval to launch by our cybersecurity organization after being scanned for weaknesses and vulnerabilities. Any personally identifiable information (PII) or sensitive information transmitted to the IRS through IRS2Go for refund status or tax record requests uses secure communication channels that meet or exceed federal requirements for encryption. No PII is passed back to the taxpayer through IRS2GO and no PII is stored on the smartphone by the application. When using our popular “Where’s My Refund?” application, taxpayers may notice just a few of our security measures. The URL for Where’s My Refund? begins with https. Just like in private industry, the “s” is a key indicator that a web user should notice indicating you are in a “secure session.” Taxpayers may also notice our message that we recommend they close their browser when finished accessing your refund status. As we become a more mobile society and able to link to the internet while we’re on the go, we remind taxpayers to take precautions to protect themselves from being victimized, including using secure networks, firewalls, virus protection and other safeguards. What do I do with the transcript? If you download tax transcripts or personal health information to a mobile device, laptop, tablet or desktop, install passcodes and full disk encryption, where available, on every machine its on. Leaving your files unprotected on computers connected to the Internet is like leaving the door to your house unlocked with your tax returns and medical records on the kitchen table. I got an email from the IRS that asks me to email them personal information to access my transcript. Is this OK? Nope! Don’t do it: it’s not them. The new functionality will likely inspire criminals to create mockups of the government website that look similar and then send phishing emails to consumers, urging them to “log in” to fake websites. You should know that IRS “does not send out unsolicited e-mails asking for personal information.” If you receive such an email, consider reporting the phishing to the IRS. Start at www.irs.gov/Individuals/Get-Transcript every time. I tried to download my transcript but it didn’t work. What the heck? You’re not alone. I had trouble using an Apple computer. Others have had technical issues as well. What does that mean, in practice? That not all modern OS/browser combinations are supported, potentially including OS X and Android, that the IRS digital staff knows it — although they aren’t informing IRS.gov users regarding what versions of IE, Windows or other browsers/operating systems are presently supported and what is not — and are working to improve. Given the comments from frustrated users, the IRS could and should do better on all counts. Will I be able to file my tax return directly to the government through IRS.gov now? You can already file your federal tax return online. According to the IRS, almost 120 million people used IRS e-file last year. Well, OK, but shouldn’t having a user account and years of returns make it easier to file without a return at all? It could. As you may know, other countries already have “return-free filing,” where a taxpayer can go online, login and access a pre-populated tax return, see what the government estimates her or she owes, make any necessary adjustments, and file. Wait, that sounds pretty good. Why doesn’t the USA have return-free filing yet? In its latest annual report filed with the Securities and Exchange Commission, however, Intuit also says that free government tax preparation presents a risk to its business. Roughly 25 million Americans used TurboTax last year, and a recent GAO analysis said the software accounted for more than half of individual returns filed electronically. TurboTax products and services made up 35 percent of Intuit’s $4.2 billion in total revenues last year. Versions of TurboTax for individuals and small businesses range inprice from free to $150. What are the chances return-free filing could be on IRS.gov soon? Creating the ability for people to establish secure access to IRS.gov to review and download tax transcripts is a big step in that direction. Whether the IRS takes any more steps soon is more of a political and policy question than a technical one, although the details of the latter matter. Is the federal government offering other services like this for other agencies or personal data? The Obama administration has been steadily modernizing government technology, although progress has been uneven across agencies. While the woes of Healthcare.gov attracted a lot of attention, many federal agencies have improved how they deliver services over the Internet. One of the themes of the administration’s digital government approach is “smart disclosure,” a form of targeted transparency in which people are offered the opportunity to download their own data, or data about them, from government or commercial services. The Blue Button is an example of this approach that has the potential to scale nationally.